I've been listening to Against Me for a really long time. While I can't say I was one of those first super early fans or anything, I have watched them go from No Idea to Fat Wreck to Sire and then to Total Treble. I've seen their style morph and change over the years. Shifting shape, if you will. They've done some records I've truly loved and have also done a few records that I didn't like as much. Where Shape Shift With Me falls in their discography is something of a mixed bag. There's a few pretty great songs on here, in particular I enjoy the straight ahead rock vibe of "12:03" and the Pogues style pogo-er "Haunted, Haunting, Haunts." The problem with this album is there is an awful lot of filler. Songs that aren't very interesting and just kind of go through the motions. "Boyfriend" is mid tempo, sung with mid enthusiasm and plods along. "Crash" is a quick little pop song, but feels so out of place and boring compared to the rest of the Against Me catalog. "Norse Truth" is certainly different from anything Against Me has ever released, but that's not a compliment. Sung with a monotone delivery with rapid fire talking vocals, it sounds like it's trying to riff on Ted Leo's "Ballad Of The Sin Eater," but it really, really falls short. Shape Shift With Me isn't a bad record, but it's not really all that good either. It's kind of middle ground. 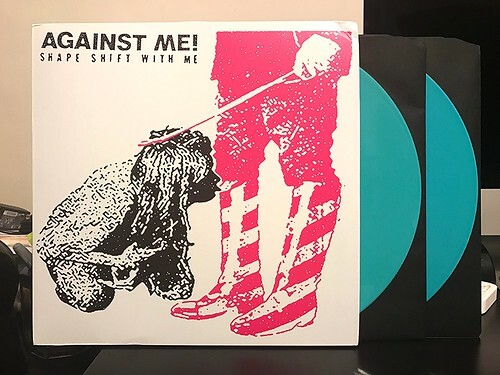 Worth the occasional spin, but it will never be anything that I listen to repeatedly, especially since there are so many other Against Me records that are much better. Agree! No point listening to this one in the future when there are 2-3 better albums from them.